15 months after a compound leg and ankle fracture in a brutal crash against a barrier on stage one of the 2017 Tour de France, Alejandro Valverde (Movistar Team) wrote the most beautiful page of his legendary career as a pro cyclist in another German-speaking city, Innsbruck, the capital of the Austrian Tirol. ‘Bala’, the ‘Bullet’, is finally the champion of the world. The leader of the Spanish national team, brilliantly protected by his seven team-mates, rode with immense composure, and only took a leading role in the race at the exact moment it was required: the 2.8km, 11% average-gradient, 28% maximum Gramartboden, also known as Höll (‘Hell’). As Michal Kwiatkowski, Primoz Roglic or Simon Yates were already out of contention before that last climb, only seven riders were able to contest the victory on its slopes: Michael Valgren (DEN), who escaped from the bunch at the final ascent to Igls; Julian Alaphilippe, Romain Bardet, Thibaut Pinot (FRA), Gianni Moscon (ITA), Michael Woods (CAN) and Alejandro, who got through the ‘wall’ with big patience while Alaphilippe and Moscon struggled to keep the group’s pace. A big, late effort from Tom Dumoulin (NED) to join the Woods, Bardet, Valverde trio, those leading the race through the top of the Höll, did not make for further moves in the run-in to the finish. Valverde was forced to take on a very long sprint, always leading the group, yet one that was fully worth it. Alejandro claimed his 122nd pro victory, undoubtedly the most relevant, and sees his efforts being made justice as one of the sport’s biggest legends, claiming a rainbow jersey after fifteen years, and six medals, in the Worlds’ road race. 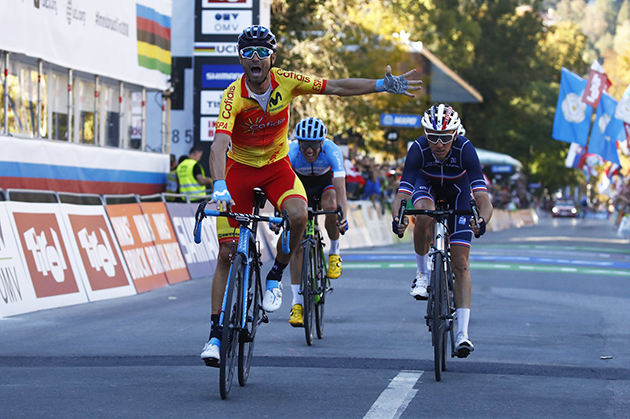 Alejandro Valverde: “I can’t believe it. I just can’t. It’s been so many years fighting for it, and we finally made it. It’s my biggest pro victory. One that I’ve fought hard to achieve for all these years. Something I’ve been chasing for during my entire career. I’ve been so close, so many times, six medals yet no golds. I even thought I would never become world champion. I didn’t get obsessed about it anymore. I always went to the World Championships with an aim to do well, but knowing it was too hard to win, even more so when you’re one of the top favourites. I had almost surrendered to that fact, but it all turned out well today. I had a superb day, we reaced really well, the weather conditions helped much – and I could make that dream finally become true. I think about my family, and all those who love what I do and always support me – this goes to them, to everybody who is happy, even many rivals who came to congratulate me after the finish. This goes to all of you. “Above them all, I want to thank my Spanish national team-mates, for their outstanding job. They made me remain so calm, all of them working hard for this success. I think the training camp we held in Sierra Nevada last week helped us much. We were able to build strong bonds, become a real family, and that had an impact on the race’s events. Everyone remained really focused at all points of the race. My job was ‘just’ to be there at the right moment, seeking for the distance where I had to launch my moves, go for the sprint and win. The rest, they did it for me. I knew I couldn’t disappoint them, I had to give my all for the team. “It was a really long sprint, where I had to take on full responsibility. I kept checking my rivals’s reactions and the finishing banners until, with 350 meters to go, I thought: ‘Now! I attack and don’t wait for anyone else.’ I was looking at them from below my saddle, seeing they remained closed but not able to overtake me. After that, the emotions, the feelings, were something I won’t ever forget. “I have invested a lot in this championship race. I had a lot of fun during those weeks of training. I knew that I would be in at the finish. There was a great energy within the French team. I am not disappointed. It would have been difficult to go faster in the sprint. 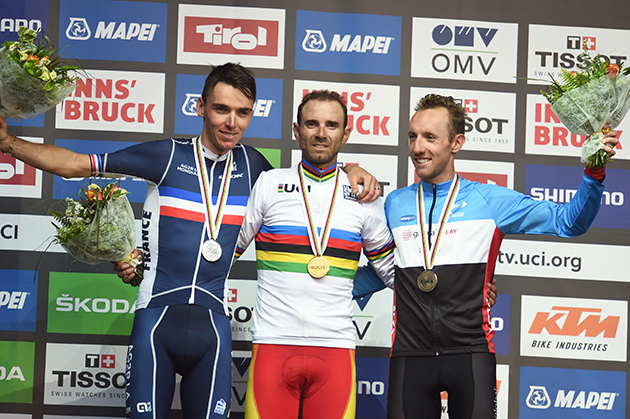 By winning the silver medal at the World Championships, Romain Bardet took his 10th podium of the season. He has one victory (Faun Environment -Classic de l’Ardèche), 4 second places (Stade Bianche, Tour du Finistere, Tour of Tuscany, world championships), five third places (Liège-Bastogne-Liège, general classification Critérium du Dauphiné and the 7th stage, as well as the 12th and 19th stage of the Tour de France). Romain Bardet’s second place at the World Championships is the first time that the AG2R LA MONDIALE team has medaled at the Elites World Championships. Last year, Benoit Cosnefroy won the Under 23 title. “This silver medal rewards the work Romain has done, as well as his commitment and that of the entire team throughout the season. I am very proud of this podium”, Vincent Lavenu, said. An 11 rider breakaway animated the opening stages of the world championships road race, with the remnants of the group brought back as Sam Oomen upped the tempo at the front of the peloton. As the group were brought back, numerous riders went clear but it was the final climb where the race exploded. Heading into the ascent one rider led the race solo and it became a battle of attrition between the chasing group in their quest for the rainbow jersey. Initially missing the group, Tom Dumoulin picked his way up the climb, riding his own tempo to make up ground on the leaders. 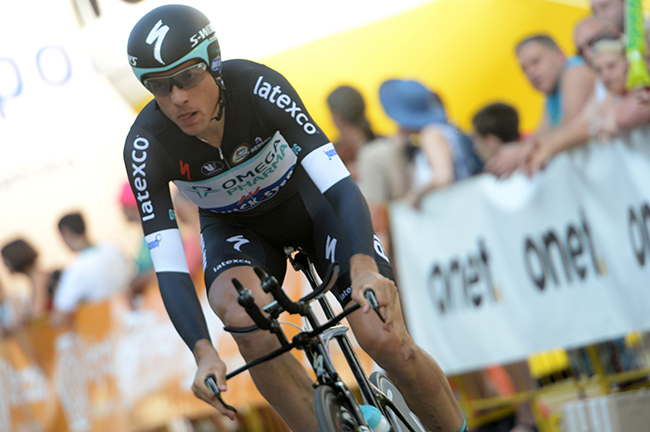 He made contact with 1.5 kilometres to go and went on to contest the rainbow jersey with a sprint between four. After taking silver at the team time trial and individual time trial earlier this week, he crossed the line to take a strong fourth place in the road race. Lotto Soudal confirms the rumours about Kevin De Weert becoming performance manager at Lotto Soudal. For three years, the 36-year-old former pro cyclist has been Belgium’s national team coach, a role in which he achieved some very nice results. He will now continue his career within the WorldTour. For De Weert, who retired from pro cycling in 2015, this will mark a new challenge.